How does a woman dress cute, comfortable, warm, and professional when it gets cold? Luckily, professional women in student affairs and beyond answered my fashion SOS. I decided to document my #OOTD’s for five days and share them with you for this month’s blog post. Disclaimer: I had a hard time staying serious during some of my daily fashion photoshoots. Women on Twitter repeatedly mentioned leggings / tights as essential, so I wore a pair of fleece-lined yoga’s (sooo warm) with an off the shoulder sweater that I’ve had forever. 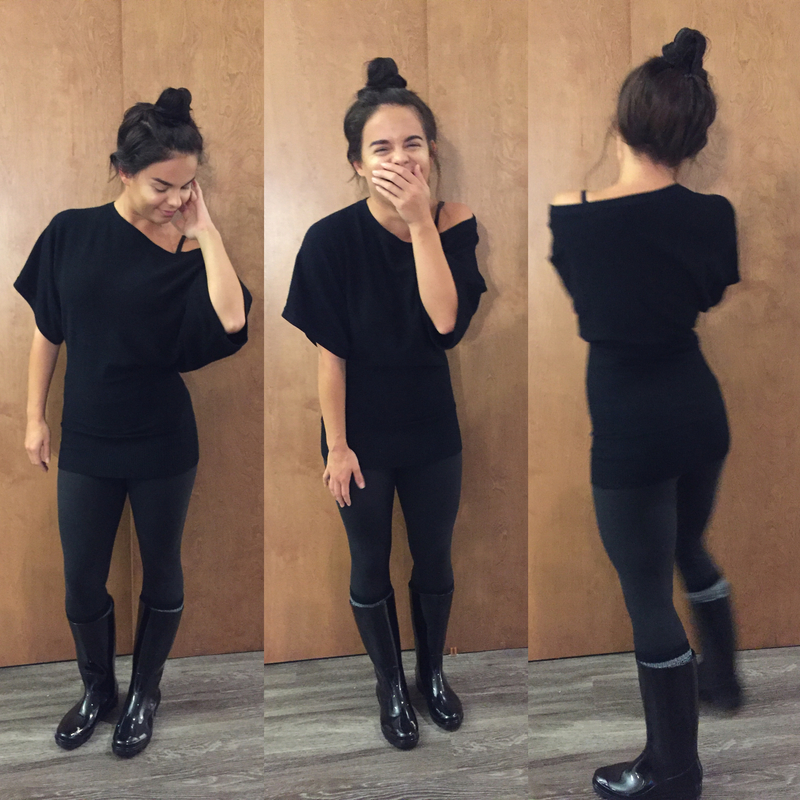 I was actually excited that it was rainy because it gave me a chance to wear rain boots. I threw my hair up in a top knot, my go-to quick style, and called it a day. This one was definitely more on the casual side, but the #AllBlackEverything added some chicness and made it work-worthy. I love extending the life of my dresses through fall by pairing them with boots. Many of the women who responded to my Twitter SOS talked about wearing layers for warmth as it gets cold. 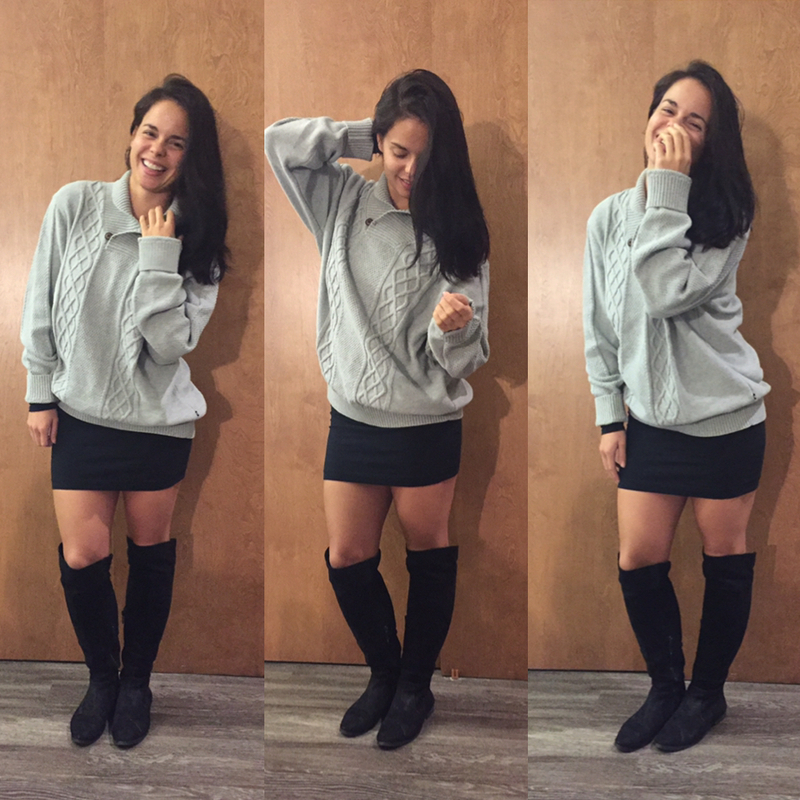 Layering this long-sleeved dress with my boyfriend’s big, comfy sweater kept me warm and cozy. This outfit was also really comfortable and easy to put together. This was a pretty warm day so I had more flexibility with my wardrobe selection. Ankle-length slacks with flats is my go-to look when the weather permits. Adding a blazer to any outfit gives makes it a little more professional, and gives me a little more confidence. It’s so true that when you look good, you feel good. I bought this dress two years ago and cut the tags off today to wear it for the first time. One positive thing that came out of this post was digging through my closet and challenging myself to wear things that I would normally overlook. I completely forgot that this dress is fleece and really warm – perfect for Fall. I felt so confident in this outfit and will definitely wear it again. This is one of my favorite looks for Fall. I have THE hardest time finding jeans that fit me, and these Express jeans are life-changing. 100% recommend. The heels were on the expensive side, but extremely comfortable and worth every penny – I’ve already gotten a ton of wear out of them. The sweater is another life-changing fashion piece from Express that I wear all the time. I never miss an opportunity to wear jeans on Friday, and this was definitely my favorite look of the week.